Well, I figure I should split up my Flamescon blog posts- otherwise it will take far to long to read let alone write! As previously mentioned, I took my Guards Rifle Company to Flamescon over the weekend, coming a respectable 12th place. I won 4 games, losing only the last match. I tied for best sport with a few others, and got an average army presentation mark. But anyway, here is the rundown of Day One. 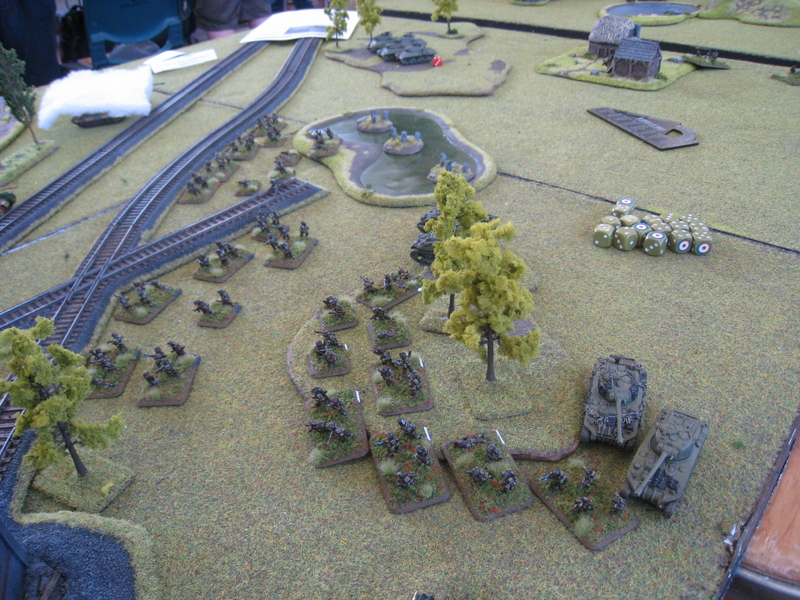 Andrew was playing an SS Tiger Company- led by none other than Michael Wittmann! The mission really, really did not suit him. Half your platoons off table? having to both defend and take objectives? Not ideal. 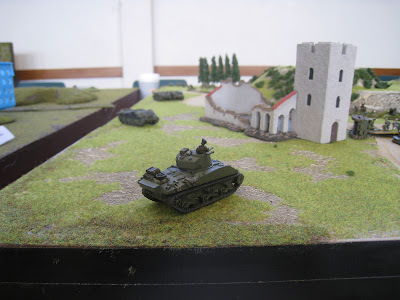 My deployment was typical of my overarching strategy against tanks- assault them! 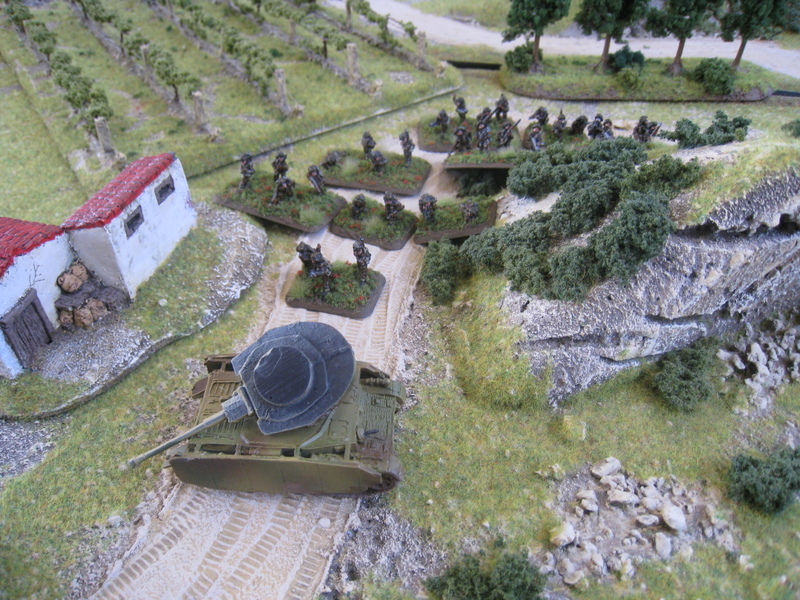 Tanks (especially with minimal platoon size) suffer greatly at covering multiple objectives and getting rid of lethal Guards assaults. I basically charged two full platoons of guards riflemen towards the near objective, with the third adopting a defensive position. 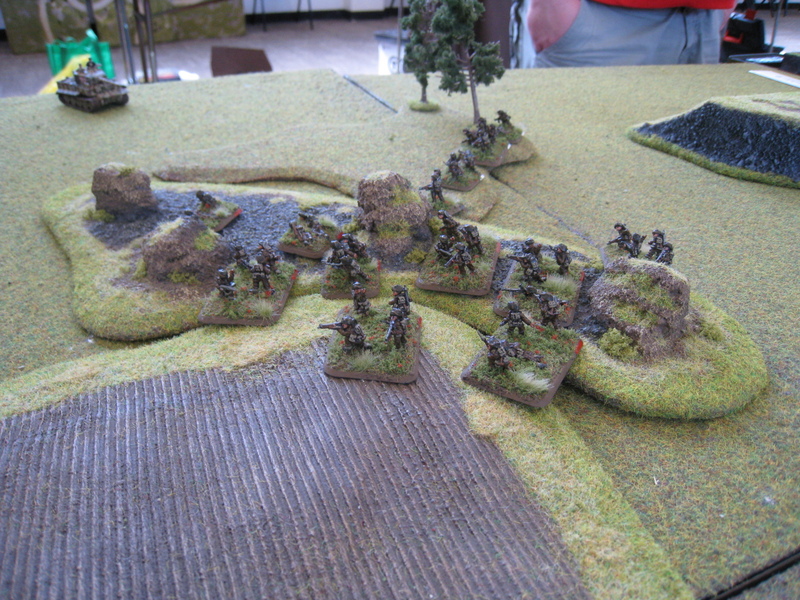 I killed his 4 SS scouts quickly and cheaply, forcing his tiger platoon to come to contest the objective controlled by the 2 platoons of infantry. 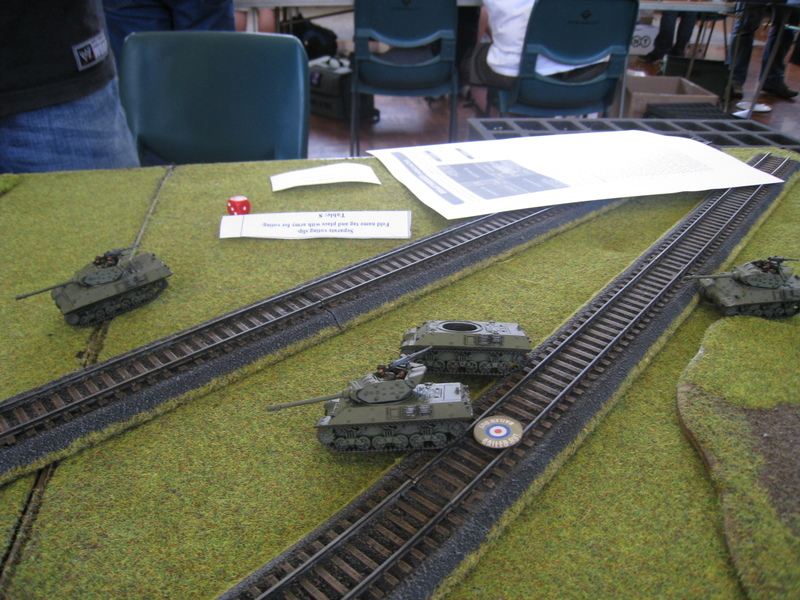 With only one objective covered by the 2 tigers, it was a simple means of having my reserve Daimlers sneak up and place themselves on the other objective. 2 tigers simply could not cover the whole area. We were playing a modified Breakthrough, the only change being that the defender gets a minimum of 2 platoons. Which in Rob's case, mattered a whole lot! He was running a Panzerspah company, with 7 Luchs, 1 platoon of 250/9's, 2 Elefants AND 2 Kingtigers. Awesomesauce. 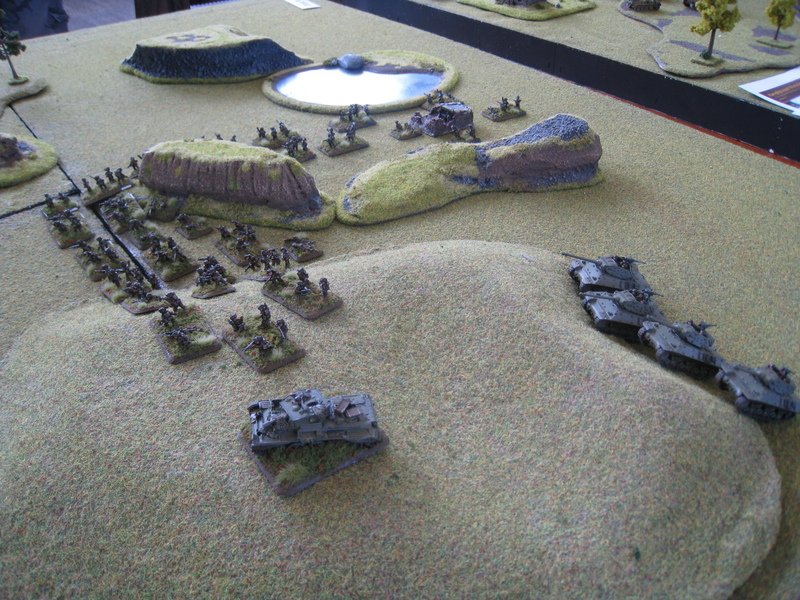 Naturally his deployment was 2 elefants, 2 kingtigers. Double Awesomesauce. So my flank march was the 6pdrs and the Daimlers, while the 3 platoons of infantry with the big stuff (17pdrs!) tried to deal with the big kitties across the board. The plan was simple, smoke and charge with the infantry, try and flank with the 17pdrs, all the while waiting and hoping that the other stuff saves the day! The M10's attempted to seize an opportunity and recieved their punishment for getting it wrong! 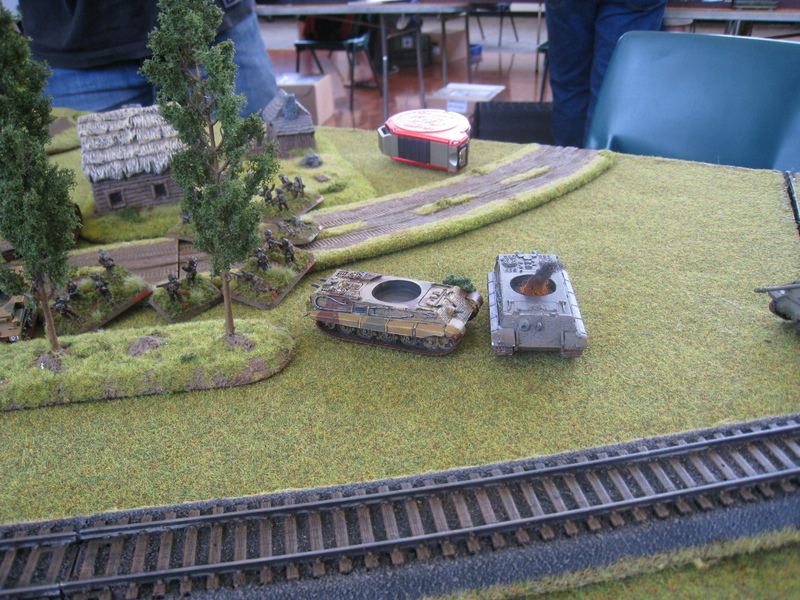 One managed to survive and kill a Kingtiger; but was later brutally cut down by Elefants. Just in the right of that shot, the prow of an M10 lurks! But on the left is the real hunters- Piats are lethal in assault! With the 2 Kingtigers and the Company HQ dead, and my reserves duelling with Luchs (and winning) the only thing that Rob had left at the end of the game was his 2 elefants, who in spite of everything just would not die! So, 2 games down, and I have played against 9 heavy german tanks. Awesome. The breakthrough was just an ok game, sure I won the game, but why would you take the list in the first place? You take Panzerspah because they are light fluffy and cool, not because they are the only list you can still have Kingtigers and Elefants in? I don't know really, just doesn't seem fun? At any rate, 4 game points and a win. Here is the gallant (and foolhardy) last stand of the poor 6 pdrs! They got viciously attacked by Panzers, without a chance to dig in or really fire at all- We did kill one, but that was not enough! The infantry did get a bit of revenge at least, the panzers were finally killed by the M10 Achillies. The late game run by my infantry to finally dig out some pioneers who had been causing me no end of strife! 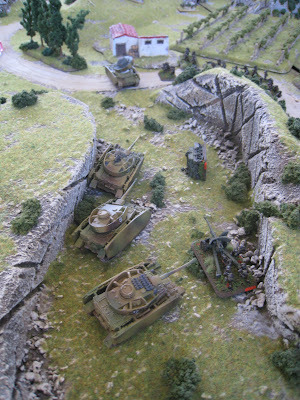 Behind those two burning Marders (killed by Shermans and Daimlers) is the objective. The Daimlers were fantastic this game, they shot up no less than 2 88's with MG's, then mowed down some infantry, assaulted a Nebelwerfer platoon off the table, killed 2 Marders with gunfire and best of all, didn't die! Absolute brilliance from the Household Cavalry! This shot sums up my day really, here is the last of my 4 tank sherman platoon at the end of the game. In the background you can see the rest of his platoon, turretless and destitute. Ahead of him lies the wreck of a Marder, with another inside the ruined monastary. 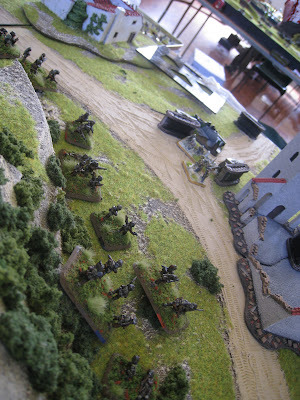 In the distance, the Guards Rifles prepare to assault and finish off the last of the FJ on the objective! A 4-3 win, and a damn fun one too. I played Eddie first game and he's a great bloke to play, he got my sports vote as well. Enjoyed the report and photos Chris. Well done. I look forward to the rest Pooch- yes, big FJ platoons are the way to go- KG if you need more! Big cats have their place, and that is definitly not to be on the recieving end of an infantry assault! The two lists I played were totally reliant on the big boys, which meant all I had to do was tie them up and kill the rest, or capture the objectives. I sort of agree re the FJ Platoon Size, though there are good points to having three flexible platoons. Looks like you had good games at the first day at least!